Messerschmitt were born in Rome in 1983 (from the ashes of Zelloffen) founded by guitarists Fabrizio Appetito and Francesco Ciancaleoni. In the first line-up also played Francesco Menna (drums), Fabio D’Olimpio (bass) and Baffo Jorg, unforgettable figure of the roman metal scene, on vocals. With the arrival of the singer Andrea Strappetti and the bassist Alessandro Chiadroni, the band gained fame in the city heavy metal scene, that in those years was taking its first steps. From 1983 to 1985, Messerschmitt joined lots of gigs, festivals, radio and television shows (including a performance at the popular television program “Tandem”, on RAI 2), playing heavy metal, mainly influenced by Judas Priest, Iron Maiden and Saxon. In 1984 the band recorded a demo, but the product, in line with the poor quality of the typical self-productions era, does not fully reflect the sound of Messerschmitt. The single “Heavy Metal Fighters”, recorded in 1985 at the Kamelot studios of Rome, sounds more mature than the former production. Despite the repertoire produced in those years, did not prevent Messerschmitt to perform as headliner in many shows, the band has never managed to record a real full length. Nevertheless, the band was granted high respect and reputation in the heavy metal local scene due its fervent live activity in the 80s. 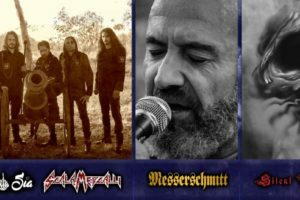 The role of Messerschmitt in the first phase of italian heavy metal scene is today testified by a quote in the book “ITALIAN METAL LEGION 1980-1991, the Days of Dream” by Gianni Della Cioppa (Andromeda Relix) Editions, released in 2005, as well as the most recent “Anni di Metallo” by Andrea Ciccomartino, a volume distributed with a CD containing some of the most significant tracks of roman metal scene of the 80s, including “Heavy Metal Fighters” by Messerschmitt. Due to organizational issues (Fabrizio Appetito left for military service and Francesco Ciancaleoni moved away from Rome), in 1985, after trying some change of line-up, the Messerschmitt split up. As a consequence, some of the original members continued their musical experiences with other bands (D.O.C., Pleasure Palace, Blizzard, Mindscape, Maskim, Machine Head, Fireball, Hush, Steel Tyrant), but in September 2007, after a simply joke-session, Messerschmitt decide to reform (the band performs 4/5 original members and the new entry Claudio Mottola on bass). This first attempt of reunion lasted only a few months and in December 2011, original members trio, Ciancaleoni, Appetito and Strappetti, decides to have a second chance, enlisting Matteo Moriconi on drums and Walter Scoccia on bass, who were coming from a Black Sabbath cover band. After 27 years, the re-founded band came back on stage at Porky’s live pub on September 28, 2012. In their show, immediately followed by other live sessions in Rome, Messerschmitt played a bill of some re-arrangements of the original songs as well as new tracks. After many years from its founding, the good response from the crowd attending most recent live performances, represents a huge encouragement for the band, as they get to work to produce the first official realease. In the summer of 2013, Messeschmitt decided for a new line-up change, so Matteo Moriconi and Walter Scoccia left the band, replaced by Luca Federici and Mario Ghio, respectively on drums and bass. With the new line-up the band records a version of Kiss classic “Deuce’” to be included in a compilation released in another Ciccomartino’s book (“Kissed by Kiss”, 2014). In September 2014 Andrea Strappetti quits the band and he is replaced by Flavio Falsone (also singer in Whisperz), but in the meantime the guys decide to release a record that includes a selection of their old hits (“Heavy Metal Fighters”, “Resurrection”, “Shape The Steel” and “Kamikaze”) still with long-time member Andrea Strappetti at the microphone, re-recorded by Fabio Lanciotti at his own ‘Bottega del Suono’ studios for Ace Records, adding in the package whole 1984 demo (“Red Baron”, “Angel Of Death”, “Outlaw Power”, “Kamikaze” and “Another Countenance”) and a precious selection from their 1983 opus (“Mister Fire”). Listening to this Lp (published in march 2015) you can have exactly the idea of what Messerschmitt powerful sound was in their old days. In the meanwhile, in September 2015, Messerschmitt decided to self-produce, in collaboration with Gianfranco Belisario (Metal Zone), a live CD entitled “Naked Truth – Live @ Closer” that includes 8 songs recorded during a gig in Rome (Closer club, in February, 27 2015). At the same time, with “Heroes Of The Rising Sun”, the band featured in the compilation “Metal Years vol. 1” (Ace records/Celtic Moon Records) published in October 2015. The song “Heavy Metal Hero”, appears, however, in the compilation “Metal Years Vol. 2 “(Ace records/Celtic Moon Records – 2017). In April of 2017 Luca “frankenfurter” Loreti replaces Flavio Falsone on vocals. Among recent live appearances of the band, it’s a must to mention the opening act for Tygers of Pan Tang in Rome (February 26, 2015) and the participation in the “Valkyries upon Italy Tour” with epic metallers Battleroar (January 2016) and in in the roman date of the european tour of Dexter ward (October 23, 2016). In September 2018 the band released a full length (CD) entitled Raising hell.